Make the meatballs by mixing the beef, onion, egg, bread crumbs, salt, pepper, nutmeg. cloves and parsley in a bowl. Lightly combine everything with your fingertips, taking care not to over work the meat or your meatballs will be tough. Form the meat mixture into small balls. I used a small scoop to help portion it out evenly. Heat the oil or butter in a large skillet. Brown the meatballs on all sides. Do this in batches and add more butter or oil if necessary. Set them aside on a plate, keeping the remaining fat in the pan. Add the sherry to the pan that you browned the meatballs in, and cook and stir to remove any bits stuck to the bottom. Add the flour and mustard powder to the pan and cook, stirring, for a minute. Whisk in the beef stock, until it is well combined. Cook until the gravy thickens and boils. Taste at this point and adjust the seasonings if necessary. 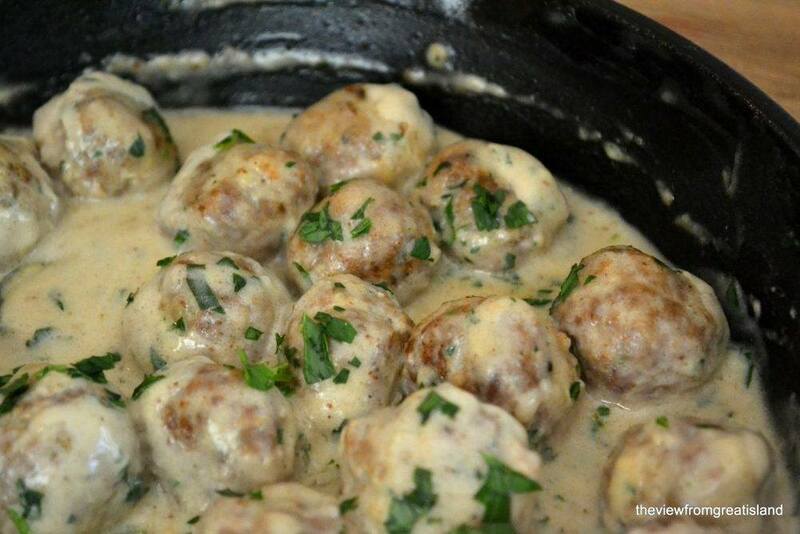 Add the meatballs back into the pan, and gently simmer for about 5 to 8 minutes, until the meatballs are done inside. Make sure to baste the meatballs with the sauce often while they are simmering. Serve right away with toothpicks and extra chopped parsley for garnish.